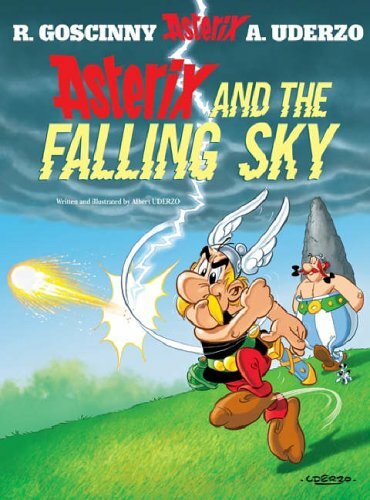 "Asterix and the falling sky", published in 2005, is the thirty third volume of the most successful European comic book series created by Rene Goscinny and Albert Uderzo. It is also only the eight one since the latter started both writing and drawing the book, which is significant considering that Goscinny died in 1977. To date, it appears that "the Falling sky" will likely remain the last full length Asterix adventure, discounting the two special albums that have been published around it, spotlighting short stories, and acting as the anniversary special, respectively. Taken on it's own, this album is also quite likely the strangest Asterix story, and certainly the one that most deviated from the classic feel of the series. The cover homages the original "Asterix the Gaul" album and both invites the comparison, and yet reveals very little of the actual details of the plot. The story proper starts as a typical Goscinny/Uderzo adventure, featuring the pair of Gaulish heroes hunting for wild boars, but wastes no time to set up it's controversial plot. Just as the reader is eased into returning to the familiar characters and their typical ways, Uderzo breaks form and adds a completely alien to what might have been a start of just another Asterix and Obelix yarn. Just seeing a 3d rendering of a simple model hovering above the Gaulish village, and spelling doom for it's defiant residents gives away the creator's intent. There is no subtlety to Uderzo's ideas at work in "the Falling sky", and just how the reader reacts to this will determine their enjoyment of the proceedings. By taking an oft repeated phrase of his characters fearing only the sky falling on their heads, and using it as a springboard to introduce a biting satire on the entire comic book industry certainly seemed as an ambitious undertaking. It's further polarizing how Uderzo gets to depicting it, tackling such a metafictional story at 78 years of age. As for the context going in what was to be Asterix's most polarazing adventure, "les Editions Albert Rene/Goscinny Uderzo" prefaces the volume with a photograph that briefly describes the artist's start in the industry. Coupled with an endearing tribute to Walt Disney that closes of the volume, Uderzo makes sure the reader understands the impulses that led to introducing such strange and off-putting science fictional elements in what was always a premiere historical comedy, exemplifying the best in European comics targeted at a younger reader. As many of his generation, young Uderzo was an artist influenced by Walt Disney and others early cartoon pioneers to contribute to the form of the newly established comic book. Thus, while him and Goscinny certainly felt inspired by the American comics Golden age, most notably by producing the western themed "Oumpah-pah the redskin", they have certainly since come into their own as quintessential European comic book authors. With "Asterix the Gaul" they had created something that was at once stylistically their own, as well as working as a period piece set 2000 years in the past of their own country. Despite the date never really advancing in the thirty odd Asterix stories since, a lot of the book's visual language and distinctive humor has since progressed to the point where it was when Goscinny died, and where it has, more or less, remained since, due to his artistic partner continuing the series. Yet, despite some of Uderzo's ideas seeming somewhat more political and controversial, never has his work been as polarizing as with "the Falling sky". Considering that it was published so late in the author's life, when his output has dwindled to producing a single album every several years, the expectations have likewise significantly lowered. "Asterix" seemed to be defined by his decades old work, much more than the obligatory new volume, that seemed an impulse purchase from his many fans, who have literally grown up reading these charming tales. As such, the impact of "the Falling sky" was even stronger, considering such risk taking was nowhere near what was expected of the venerable, and widely beloved creator. Yet, he was interested primarily in pointing out the special place Asterix and Obelix, and even broader, the Franco-Belgian comics, had on the comic book landscape, as defined by it's two largest industries, America and Japan. 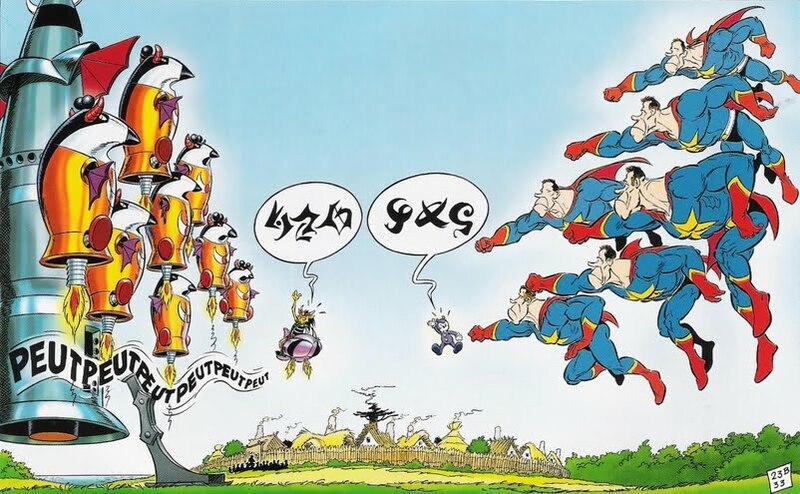 In order to make his points clear, he decided to borrow the narrative vocabulary of these distinctly different school of comic work, and proceeded to incorporate it wholesale in his existing, well-defined Asterix mythos. The result was bluntly putting into play two interstellar races coming to Earth in search of Getafix's magic potion, and stopping at nothing to hide their presence. Such a dramatic departure was potentially meant to be lessened by introducing a Mickey Mouse analogue in "Toon", the ambassador of Tadsilweny (a Walt Disney anagram) empire, as well as showing the reaction of his regular protagonists first and foremost. And while the reader was to be entertained by just such a diversion, the in-jokes still feel odd and overpowering. And while Uderzo never proceeds to introduce more of emperor Hubs' (anagram of former president George W. Bush) forces beyond the Superman clones, what little there is of the political commentary thankfully quickly gets subdued. Unlike his superhero parody, further cementing the idea that the aliens' search for the magical potion doubles as the commentary on America's campaign for finding the weapons of mass destruction in Middle East would have surely driven the book into a territory simply unsuited to be dealt with using these children's characters. This is likely for the best, considering that the addition of Nagmas, the Japanese-styled race with a corresponding set of anagrams, further complicates Uderzo's specific viewpoint. As opposed to the Tadsilweny invaders that Asterix and Obelix can somehow deal with, these other aliens are much more hostile, and depicting as possessing none of the whimsy of their interstellar rivals. 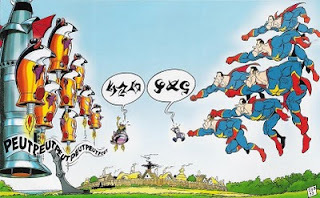 And while Uderzo certainly plays his homages to Disney and Superman prototypes as both whimsy and dim-witted, not a lot of that spirit remains for their Asian counterparts. In fact, the mangas are presented as single-minded and malevolent, hostile to both the Gauls and their newfound allies. This hilariously one-sided argument serves to demonstrate manga's rapid expansion of the last couple of decades, but it still seemingly betrays the creator's bias. 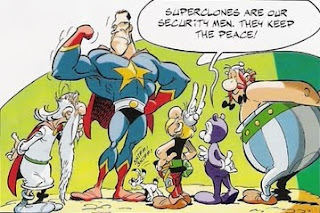 Simply by paying attention to the somewhat tenious connection between Asterix's magical potion and that of the superclones' powers of strength, Uderzo seems to group them together and against the Asian invasion. The cockroach like armor and a martial arts substitute seem like a poor match for the united Gauls and Tadsilweny, making for an early climax that circumvents the role the Roman invaders have played in the plot so far, to make for the second ending only pages away, that ends the book. Thus, the manga homages end up playing the role during the book's central act, only to be literally off the face of the Earth during it's final part. Concentrating on making his Disney homage be even more transparent, Uderzo sacrifices some of the book's drama, in order to bring back his own characters in the fray once more. The resulting clash with the Romans is once more a delight to read, if perhaps too brief. Solving the aliens' last minute dilemma, Asterix and Obelix make way for a twist ending, that once again approaches the territory of universally reviled tropes in fiction. In a very polarizing move, the creator solves the problem of having such an unwholesome element in the series' canon, one that truthfully always lept of the page as extraneous. Thus, making good on the false climax a ten odd pages before, Uderzo finishes with a couple of typical Asterix jokes to round out the volume, and say goodbye to his characters under the computer generated background of the evening sky. Not surprisingly, Obelix the menhir maker ends up stealing every scene he's in, as the richest and organic part of the landscape, with some of his fellow villagers playing their typical roles to entice a pleasant nostalgia in the long time reader. Uderzo was severely criticized for almost every aspect of "Asterix and the Falling sky", from the obvious clashing tone to the simplicity of the art style that he and his assistants have given the work, but the artist is still to be commanded for the exhibited ambition. The whole volume was certainly an experiment on his part, meaning that it was always going to be polarizing to the conservative readership, but it also seems to speak from the heart of a veteran comics professional, about the phenomena that he finds personally interesting. 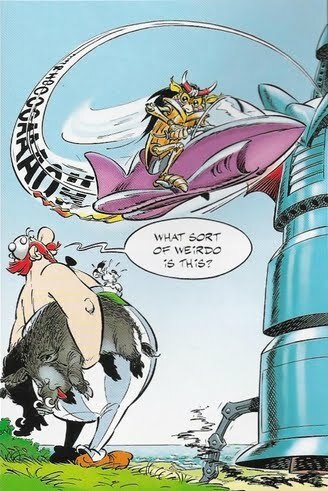 And while it's always the finished product that bears examination, not the original idea that inspired it, Uderzo's execution still feels typically tongue in cheek and charming as all of the classic Asterix stories. It is perhaps unfortunate that his final larger story was to be such a controversial offering, but despite the oft-putting introductions and a generally disconnected final product, this book proves why it closes the series. "Asterix" has been good to Uderzo in a ways that even the most optimistic couldn't have expected, and in the end all that was left for the creator was to subvert the dynamic and try to entertain himself in ways that distance him from the fifty years of colorful stories. 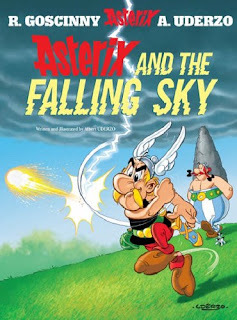 His subsequent decision to sell his share of the rights for the property, to make way for further stories by his assistants and eventually different creators, ensures that the series continues beyond his involvement, no doubt trying to evoke much more of the familiar Asterix elements beyond the ones featured in "the Falling sky". This blog serves as an archive of my comic book reviews, with the focus on independent publishers. The analyses rarely cover single issues, instead concentrating on complete story lines, mini-series, and graphic novels.